Our 240 volt switched mode replacement power supply is used for most of our products with some exceptions. If you are unsure about which general power supply you need then contact us first. The UK switched mode power supply is RoHS and CE compliant. Because any other power supply will render your warranty void. 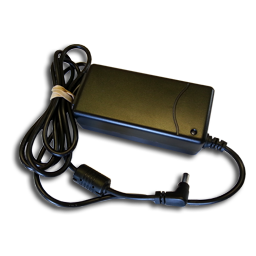 This switched mode 240 volts power supply is only available from Long Range Systems UK and must be used as directed. Our one line alphanumeric text pager is unique in the paging world. Its robust, designed for on the shop floor and is rechargeable. a single charge can last as long as 48 hours. The Star pager known also as a server pager, staff pager or buzzer has 4 unique leds that operate with the right long range systems UK transmitter can display many different messages. Its rugged and designed for extended use. Will operate for up to 48 hours from one charge. A customer or patient pager that allows operators to put a message on two sides of the pager - unique in the industry. Tamper proof. Easily cleaned protecting against bacteria. Our T7470 transmitter is suitable for all the pagers we can supply. Its a high power transmitter that can also send SMS texts to customers or staff. This medium power transmitter is used throughout the UK by major chains and usually is used in kitchens (but could be for ANY industry) and can transmit with just one touch of a button to up to 999 pagers. This is a medium power transmitter for the UK and can transmit any of 8 messages to up to 999 pagers. The T7470-232 serial transmitter can be controlled through a serial port and can transmit to every pager Long Range Systems make. But also is used for a signal boost repeater to extend the effective range of all LRS paging equipment.